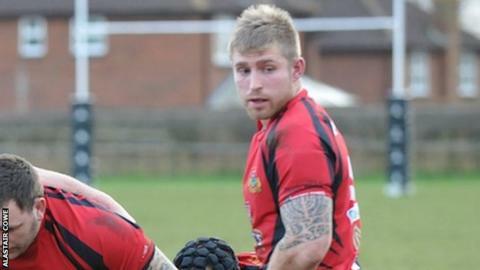 Redruth boss Adrian Edwards hailed his side's 69-0 win over Lydney as a "complete team performance". The Reds stayed second in National Two South after scoring 10 tries, including scrum-half Greg Goodfellow's hat-trick. "Second half, I wouldn't say was faultless, but it wasn't far off it, we played some outstanding rugby," Edwards told BBC Radio Cornwall. "We probably haven't hit top shelf in the last few games but there are nor complaints in that performance at all." Owen Hambley, Nick Simmons, Goodfellow and Craig Bonds all touched down in the first half as as the Reds opened up a 26-0 interval lead over second-from-bottom Lydney. Tom Notman then went over twice, Simmons added his second and Damian Cook and Neal Turner both crossed before Goodfellow scored two tries late on. "Last week he had a rocket up his backside, but when he's like that, he's absolutely outstanding - but we need him like that week in, week out. "What's been pleasing is his reaction from last week, he knew he didn't have the greatest of halves. "He came off at half-time and that's the response he gave, and it was brilliant to see."